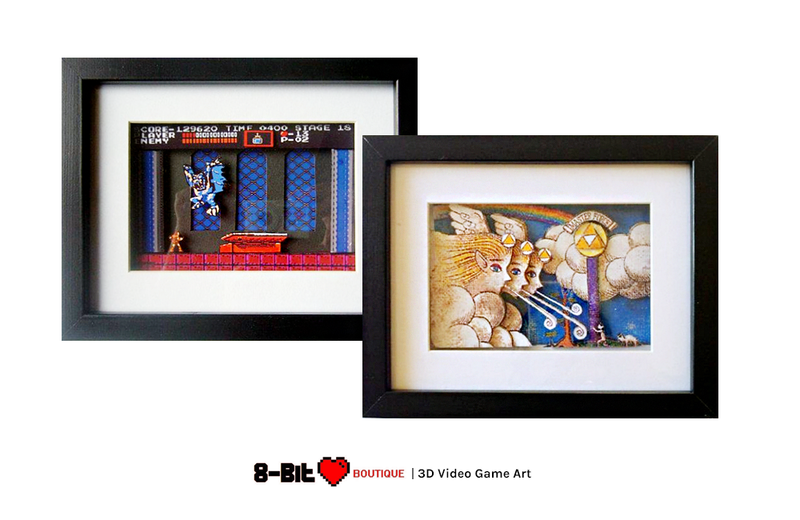 Retro-gamers can now pay homage to the 8-bit era by decorating with custom video game art from the UK-based 8 Bit Boutique. The company offers framed 3D diorama shadow boxes inspired by iconic video, arcade, and pinball games. Each shadow box is available in two sizes: 9-inches wide x 7-inches high or 15-inches wide x 12-inches high. Either size is 1.5-inches deep. The artwork is printed on premium, high-grade glossy card stock then hand-cut and layered to create the desired 3D effect. Completed art is protected by a solid wood frame with a glass front. The boxes ship with both a hanger and stand so you can choose between wall-mount and shelf-display options. There are well over 100 designs to choose from, including Legend of Zelda, Donkey Kong, Mortal Kombat, Sonic the Hedgehog, and other classics. The price for each shadow box starts at £24.99.